Tsukiji (築地) is a district of Chūō, Tokyo, Japan, the site of the Tsukiji fish market. Literally meaning "reclaimed land," it lies near the Sumida River on land reclaimed from Tokyo Bay in the 18th century, during the Edo period. There are also districts named Tsukiji in Kobe and Amagasaki, cities in Hyōgo Prefecture, although neither is as well known as Tokyo's. 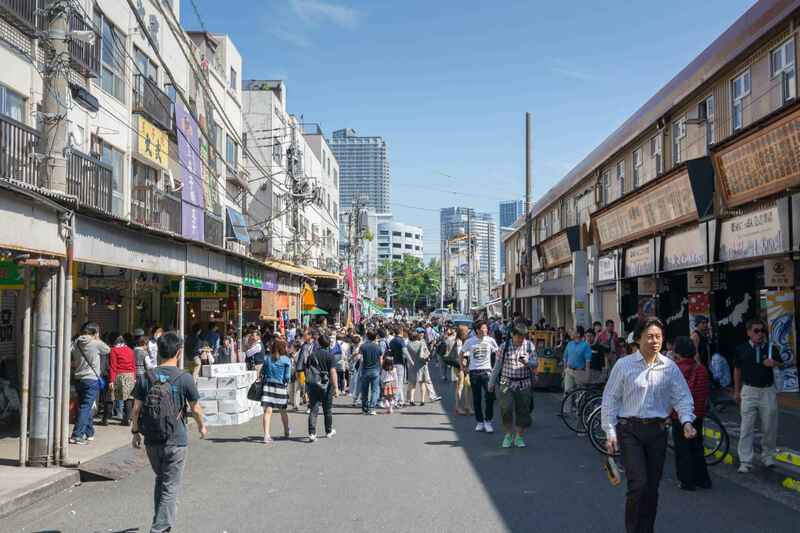 For many residents and visitors to Tokyo, the Central Wholesale Market, better known as the Tsukiji fish market is synonymous with sushi, sashimi and seafood products of every kind. While the inner market in the early hours of the day has restricted access and is very much a working facility catering to wholesalers, the many small neighbourhood restaurants, restaurant supply stores and retail operations in the outer market still act as a major culinary tourist destination. Tsukiji is the largest fish market in the world handling more than 2000 tons of 450 types of seafood daily. Tsukiji Hongan-ji, a key temple of the Jōdo Shinshū sect of Buddhism. Inside the temple is a small memorial to deceased popular rock star hide. 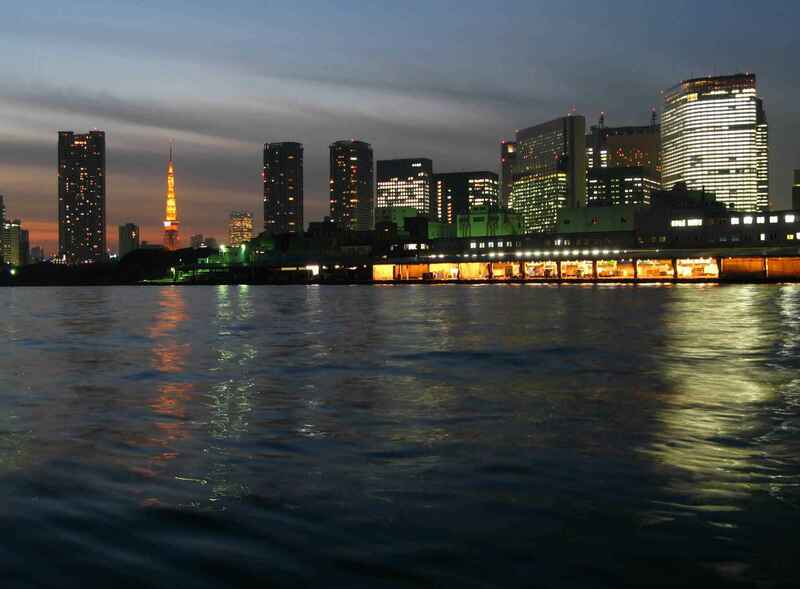 The Sumida River, the Tsukiji riverbank has pedestrian access north of the Kachidoki Bridge. Quieter backsteets of Tsukiji still feature some older properties and storefronts clad in copper tiles used in the early Showa Period as a means of weather-proofing and distinctive architectural decoration. St. Luke's Garden, one of Tokyo's taller buildings containing, offices, a hotel, residential and long-term care accommodation. Part of the St. Luke's International Hospital campus. The Sumida River (隅田川 Sumida-gawa) is a river that flows through Tokyo, Japan. It branches from the Arakawa River at Iwabuchi and flows into Tokyo Bay. 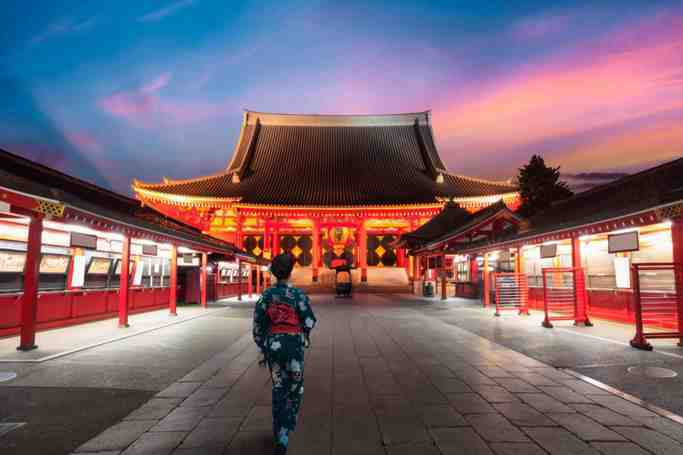 Its tributaries include the Kanda and Shakujii rivers. What is now known as the "Sumida River" was previously the path of the Ara-kawa. However, towards the end of the Meiji era work was carried out to divert the main flow of the Ara-kawa to prevent flooding. The Ryōgoku-bashi (Ryōgoku Bridge), dating from 1932, replaced a bridge built in 1659. This bridge was immortalized many times by Hiroshige. The Eitai-bashi (Eitai Bridge), dating from 1924, replaces a bridge built in 1696. The Senju Bridge, dating from 1921, replaced an earlier bridge initially constructed in 1594, which was for a long time the only bridge across the river. The Sakura Bridge, dating from 1985. The Kototoi Bridge, dating from 1928, was reconstructed at the location of the bridge which linked two nearby temples—the Mimeguri-Jinja and the Matsuchiyama-shoden. The Azuma Bridge, dating from 1931, replaced the bridge which was first built in 1774. This bridge is closest to Asakusa Station and the Kaminari-Mon. The Komagata Bridge, dating from 1927, takes its name from the Matsugata temple dedicated to Bato-Kanon. The Umaya Bridge, dating from 1929, replaced a bridge built in 1875. The Shin Ohashi (New Bridge), dating from 1976, replaced a bridge built in 1693. This bridge was not far from the Ryōgoku Bridge. The Kiyosu Bridge, built in 1928 after the model of the Deutz Suspension Bridge of Cologne, links Kiyosu with Nihonbashi-Nakasu. The Chuo Bridge, dating from 1994, is the most recently built of the bridges across the Sumida. The Tsukuda Bridge, dating from 1964, was the first bridge built after World War II, crossing the river from Tsukiji to Tsukishima. The Kachidoki Bridge was constructed in 1940 for the commemoration of the victory of the Japanese army at Lushun during the Russo-Japanese War. This bridge is the only drawbridge on the Sumida, and has not been raised since 1970.